Please note: We cannot give refunds for any returned books or DVDs - for obvious reasons! Modern book (2017) by Charlie Walker showing techniques for making all the "traditional" British types of stick (Crooks, Market Sticks, Thumbsticks, Knobsticks etc). Well written and with great photographs - this is THE BOOK to get if you are on a tight budget! NOTE: books are zero rated for VAT and the price you pay does NOT contain VAT - however, it will appear in the shopping cart as though VAT has been added. This is because our cart cannot separate different VAT rates, sorry! "Stickmaking - The Complete Guide" NEW in 2018! Amother book by Charlie Walker. A bigger book, both in size and the amount of information and photos it contains (hence the price). Everything you want to know on any aspect of modern stickmaking! 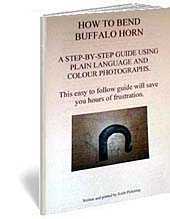 "How to bend Buffalo Horn"
Small home-made booklet by Keith Pickering. A detailed step-by-step guide showing you the 'easy' way to make Buffalo Horn handles. It includes colour photo's of the horn-bending jig (on sale on the Horn DIY page) in use - with advice on how best to use it. "The Little Book of Whittling"
Passing time on the trail, on the porch and under the stars. A fantastic soft back book that shows how to use "green" wood, freshly cut from the bushes, to carve into all sorts of useful items - whistles, flowers, knives and even walking sticks! A great little book for scouts and other youngsters - from nine to ninety year olds! 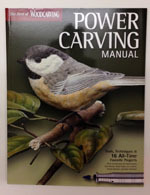 For anyone thinking about starting to carve with rotary or reciprocating carvers this is a brilliant book! If you already use power and want to improve or learn new tricks it will also be of great help. 150 pages covering subjects such as types of carvers and suppliers (mainly American, but many can be bought in the UK). A comprehensive section on burrs and bits is really helpful, along with techniques needed to use them. Many of the subjects covered (with templates) can be adapted for stick heads and there's a nice section on carving a wizard's head on a stick or staff. The sections detailing how to produce furr and feather details are simply great! NOTE: books are zero rated for VAT and the price you pay does NOT contain VAT - however, it will appear in the shopping cart as though VAT has been added, sorry. 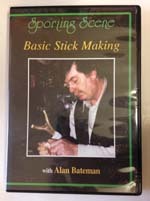 DVD by Alan Bateman showing the basics of cutting and straightening shanks and making plain and simple sticks from wood and antler. 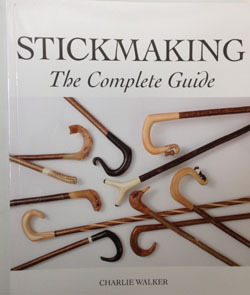 Aimed at beginners it is a good starting point for anyone interested in taking up or improving their stickmaking. 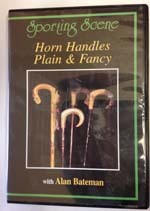 "Horn Handles Plain and Fancy"
DVD by Alan Bateman showing more advanced techniques used to make horn handless Aimed at more experienced stickmakers or anyone with an ambition to make horn handled sticks, rather than wood or antler.